Bayern Munich stalwart Javi Martinez is back in midfield and back in top form under his old mentor Jupp Heynckes. The Spaniard is set to make his 100th Bundesliga appearance when the champions and league leaders host Werder Bremen on Sunday. When Martinez arrived in Munich after the 2012/13 season got under way, Bayern were hurting. Three months previously, the record champions had watched dreams of a treble turn into nightmares. First, they had lost out to Borussia Dortmund in a thrilling Bundesliga title race. A week after the final day of the league campaign, they were hammered 5-2 by Dortmund in the DFB Cup final. A week after that – and no doubt worst of all – they lost to Chelsea on penalties in a UEFA Champions League final played in Munich. May 2012, then, was a tough time for everyone connected with Bayern. Heynckes, though, knew just what was needed to give the club a lift. He requested that Bayern sign a midfielder who had been part of the Spain squad that won UEFA EURO 2012, but who was not all that well known outside his homeland. 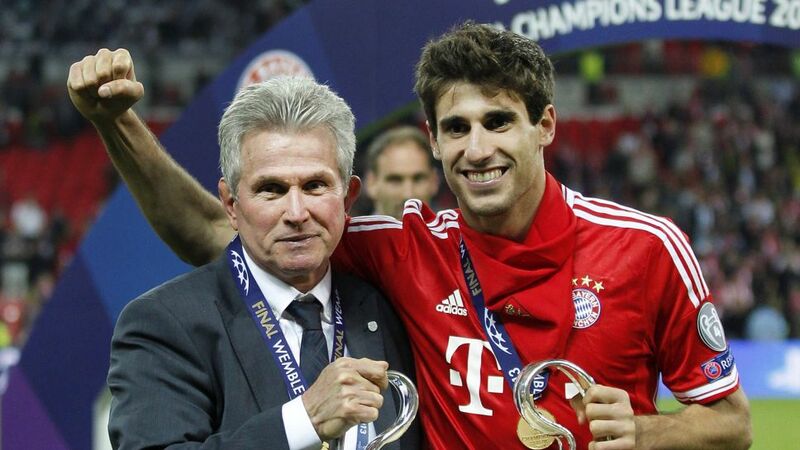 “I can still remember when Franz Beckenbauer said ‘Javi Martinez – who is that?’”, Heynckes told kicker last November. Bayern’s headline signing in August 2012 was the most expensive in their history. The new arrival from Athletic Bilbao will have realised just how big a club he had joined when he made his Bundesliga debut at the Allianz Arena on September 2, 2012. On his 24th birthday, Martinez came on as a substitute as Bayern thumped Stuttgart 6-1 on Matchday 2 of the season. With other summer signings Dante and Mario Mandzukic also finding their feet, the Osasuna academy graduate soon began to justify his transfer fee by providing a perfect screen in front of the Bayern defence. A spectacular first goal for the club helped him settle too, as he hooked home an overhead kick in a 5-0 thrashing of Hannover in November 2012. Bayern won 14 games in a row after the winter break to smash the previous longest winning streak and, in doing so, wrestled the title back from Dortmund in record time. Martinez scored three goals in 27 matches as Bayern finished with 29 wins from 34 games. They only lost once and conceded a mere 18 goals. In Europe, too, Martinez was impressive. Bayern won 4-0 on aggregate against Juventus in the UEFA Champions League quarter-finals and 7-0 over two legs against Barcelona in the last four. The latter pair of matches stunned the world of football, and Martinez received widespread praise for helping to stifle the much-fancied Catalans. Against old rivals Dortmund in the final, Bayern’s Spanish import started alongside Bastian Schweinsteiger in a 2-1 win at Wembley. Dortmund, Heynckes told kicker recently, had been the better team initially, but he felt Martinez turned the tide in a defining victory. “He won three or four tackles and from there the machine started to run,” the Bayern boss said. On June 1, 2013, the Spaniard’s incredible debut season came to an end when Bayern completed the treble by beating Stuttgart 3-2 in the DFB Cup final. The fact that Martinez is only making his 100th league appearance now is purely down to the injury problems that hit him over the next three seasons. A groin operation hindered him in the 2013/14 campaign, while he missed all but one game of the following season after tearing his cruciate knee ligament in the Supercup match against Dortmund in August 2014. Martinez was used more often at centre back by Pep Guardiola and Carlo Ancelotti, but the return of Heynckes last October immediately coincided with him returning to defensive midfield in a 5-0 win over Freiburg. Then a team is not so vulnerable defensively, Heynckes told kicker, and in Martinez he had a superb defensive player who is good on the ball, has a great engine and is strong in the tackle. In the nine league matches since Heynckes returned, Bayern have conceded only five goals. Martinez was named as captain for November’s trip to Borussia Mönchengladbach and got his first league goal of the campaign in the Matchday 18 win at Bayer Leverkusen. “It was a flawless display,” Heynckes said after the latter game. A switch from central defence to midfield is “enormous at this level”, according to Heynckes, but Martinez had made it look easy. Now in his sixth season at Bayern, the 29-year-old admits that Heynckes had a huge influence on his career. It’s clear too, that he is once again flourishing under the former Gladbach striker’s coaching. Back in the position he has always played under Heynckes, Martinez is a major reason why Bayern have won all but one of their 17 matches since their veteran coach returned. Much like the first year the pair worked together, it could well be another memorable season. Click here for more Bayern Munich, news, views and features!